SCOTLAND: Bagpiper Drowns Out Preacher [VIDEO] - Joe.My.God. A St. Andrews busker has been hailed after he drowned out a noisy street preacher – by blasting out Scotland The Brave on his bagpipes. 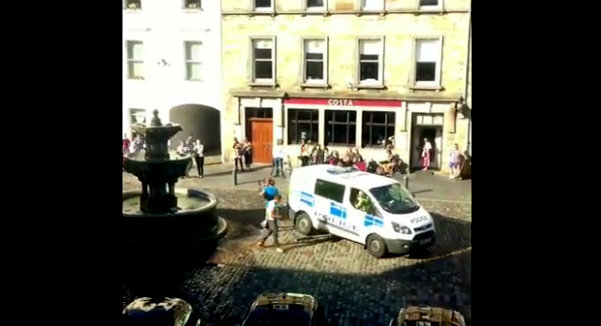 Footage posted by Lachie Blair on the Overheard in St. Andrews Facebook page shows a man using a small amplifier to shout out his message beside the fountain in Market Street. Locals said his message was almost impossible to understand, but seemed to be aggressive and was ruining the atmosphere on a lovely sunny day in the town. Which all explains why cheering can clearly be heard as the young piper moves into shot and puts the preacher in his place. As Lachie puts it, the piper wins this battle ‘in the most Scottish way possible’.